Attach the air pump to the tank above water level as directed by the manufacturer. If the power fails, water may drain back out through the air tube and damage the pump or other parts if the pump isn’t above the water level. 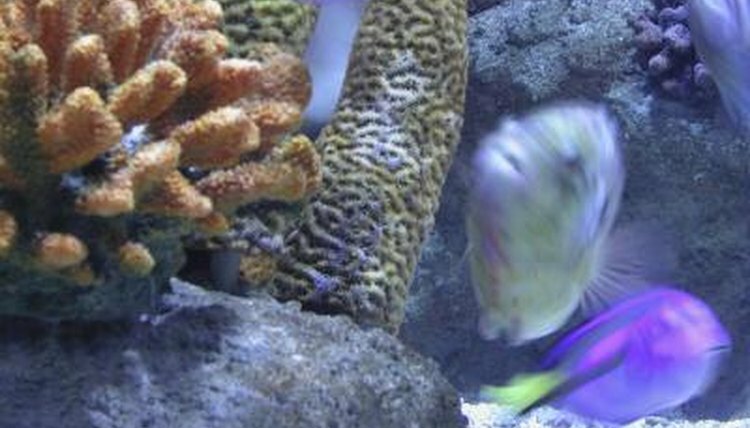 Wash the air tube inside and out with water before using it in your aquarium. Remove any residue left from the manufacturer. Place one end of the air tube around the air flow valve from the air pump. The manufacturer's diagram should provide the location. The tube should slide on by hand and fit snugly. If it is a tight fit, twist the tube as you connect it. Attach the free end of the air tube by sliding it over the air intake valve on the bubble rock, ornament or air producer of your choice. Plug in the air pump and watch for bubbles.  Check your air tube often for leaks. If the air flow is low, replace it.